This simple rustic soup has its origin in Italy. It works best if you use good, homemade or artisan bread. And, although many recipes will suggest you use fresh tomatoes, I only do so in the summer when the tomatoes in this country are ripe and full of flavour. For the rest of the year, it works very well made with canned tomatoes although it is perhaps not so wonderful eaten cold. It is very much from the same school as the recipe for Ribollita I learnt cooking in Tuscany. A way to use up left over bread, I first came across it in my local pub and was fascinated at the transformation of the ingredients into something quite glamourous, albeit very substantial and filling! You’ll find versions of this dish where the bread is chunkier. It’s very much about personal taste and for me also about whether I am serving it hot or cold. The most essential ingredient after the tomatoes is good quality extra virgin olive oil. While you can make a store cupboard version like the one shown here, using canned tomatoes, you really do need olive oil that has some bite to make this dish work. Add the bread and stir till all the oil is absorbed. You may add another tablespoon of oil for a richer soup. Add the thyme, either as a small bundle or by stripping off the soft leaves and discarding the stalks. Add the tomatoes and around 1.5 litres of stock. Bring the whole mixture to a gentle simmer and cook for around 30 minutes till all the bread is soft. If the thyme has been added as a bundle, remove it at this stage. Now, mash with a potato masher or use a stick blender to blitz. Season with salt and pepper to taste. The consistency should be like that of porridge. Tear most of the basil leaves into the warm soup and if you. Ideally cover and allow the mixture to rest for a few hours then reheat gently. Serve garnished with basil and with a good drizzle of extra virgin olive oil for each bowl. If you like a spicier version, it’s perfectly acceptable to add in some chilli flakes to the tomato mixture when you are cooking. The quantities of bread and olive oil in this recipe make it quite high in calories (around 300 calories a serving). And, the winter version I’ve made here really does need plenty of olive oil to be successful, so I haven’t tried to do a 5:2 diet version of this dish. 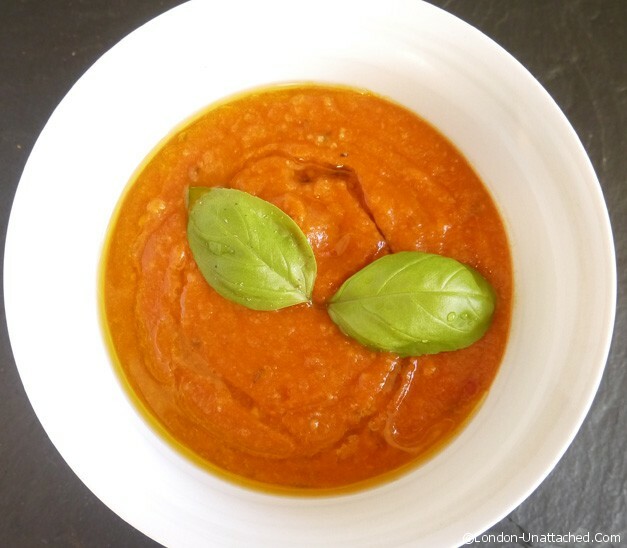 If you want a lower calorie tomato soup for winter, please try my 5-2 diet spicy tomato and lentil soup which works well for the 5:2 diet or any other low calorie diet. this might be better with a dash of Tabasco’! ‘this might be better with a dash of Tabasco’! Great recipe, I can’t wait to try it out. I agree that homemade tomato soup is much more tastier than tinned soup. Mark of success for me was that my brother liked this better than Heinz! Whoops – I meant to say that I didn’t like TINNED tomato soup, but soup made with tinned tomatoes is delicious! 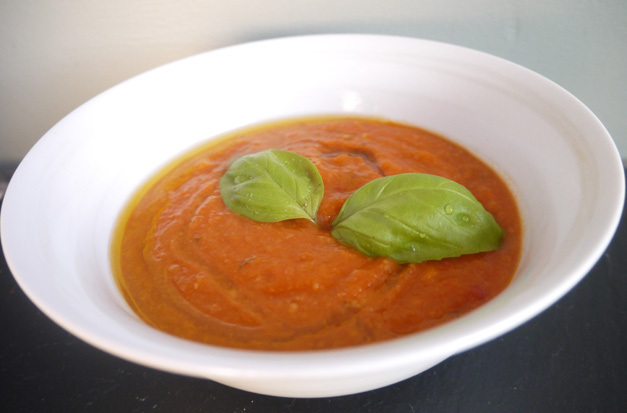 For years I thought I didn’t like tomato soup – it turns out that what I don’t like is tomato soup! Doh! If I had this when I was growing up I wouldn’t have been missing out all those years! And what a lovely way to use tinned tomatoes and stale bread – fabulously frugal! lol rachel, I know what you mean. Tinned tomato soup has sugar added I think, which makes it just a bit sickly.